No matter what the job is or who's doing it, this is the table that guarantees a superior performance! As versatile as it is durable and attractive, the Alvin Workmaster's angle adjusts from the front or the rear of the table, from 0 to 40, and its height from 29" to 46" (from 74 cm to 117 cm). 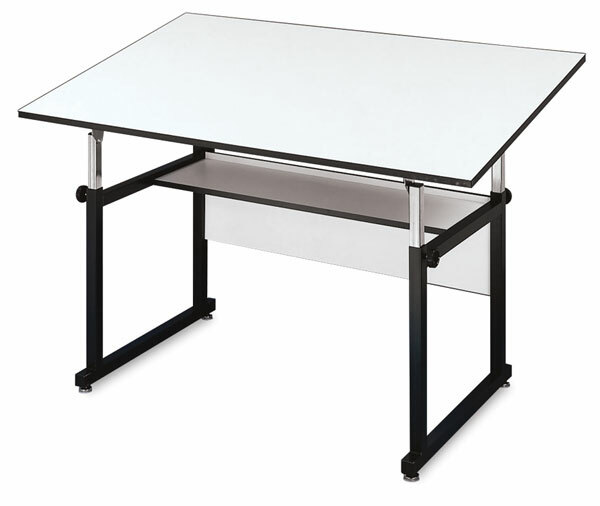 The base is constructed of heavy-gauge steel tubing, and the top is white Melamine with a black banded edge. Some assembly is required, including drilling the mounting brackets on the underside of the table top. Beneath the top is a 12" (305 mm) wide storage shelf, positioned so that it's easily accessible, yet not in the way. Workmaster Junior — The same durable table as Workmaster, only smaller. Its tilt can be adjusted from the front or back, from 0° to 35°, and the tabletop can be raised from 29" to 44" (from 74 cm to 112 cm). 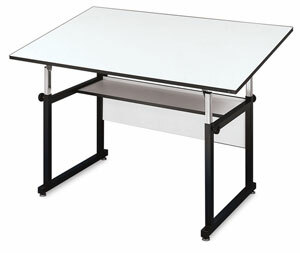 To view a PDF of the assembly instructions and parts list for the Alvin Workmaster Drafting Tables, please click here.